Hello and welcome to a new episode of For Him (And Then You Steal It). I’m on a plane back from L.A. where I reluctantly opened an amenity bottle of Malin + Goetz Rum Hand & Body Wash at The Mondrian, where I was staying with Vogue for an amazing GAP 1969 event you can read about here … anyway, I say reluctantly because I love that brand but what in the world does rum shower gel smell like? And why didn’t I pack some soap? Well, I was pleasantly AMAZED because it smells unbelievably good - warm, yet clean, with a kind of androgynous sweetness. Very very different, and very good. 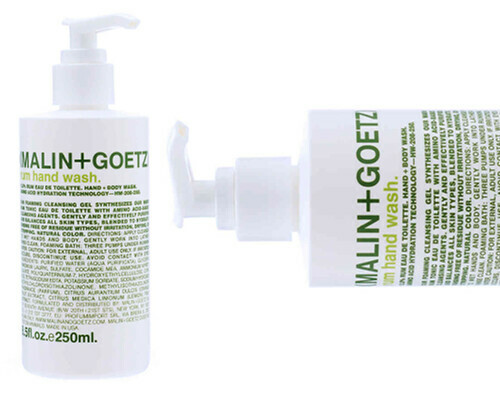 If you want an excuse to shop Malin + Goetz, hop on over there and get this for your man, because for whatever reason if a product has a name that has to do with alcohol, guys like it [mysteries of life]. And then get really into space efficiency in your shower and next thing you know, oh, there’s only one cleanser … Cheers to that.